Don Johnson, USA Councilman , and Richard A. Smith, College Editor, are both members of the World Council of the ICD and they attended the annual meeting of the Council in Sydney, Australia last September. They were joined in their travels by Leon Aronson. 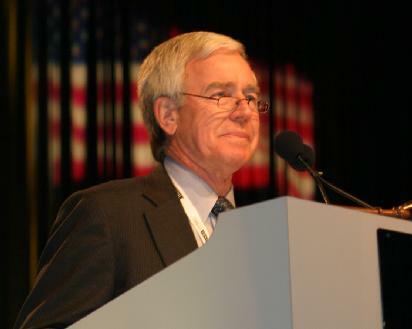 Don is secretary-treasurer of the USA Foundation and serves on the International Communications Committee. He is the driving force behind upgrading our website at ICD.org where now anyone can access current, accurate and comprehensive information about our ICD. He chairs the Information Technology Committee for both the USA Section and for the College-at-Large. Richard Smith also serves on the Executive Committee, the Communications Committee, the Information Technology Committee, and he chairs the History Committee. He envisions the immediacy of electronic media as helping to shrink distances within the ICD. Leon Aronson is serving as Vice President of the USA Section. He has a great interest in the ICD philanthropic projects where he has chaired the USA Section Projects Committee. Johnson, Smith and Aronson also helped to represent us at the European Section meeting in Ireland last June. Ty Ivey has been appointed by 2004 ADA President Gene Sekiguchi to serve on the ADA Task Force to study the Alaskan Dental Health Therapist. 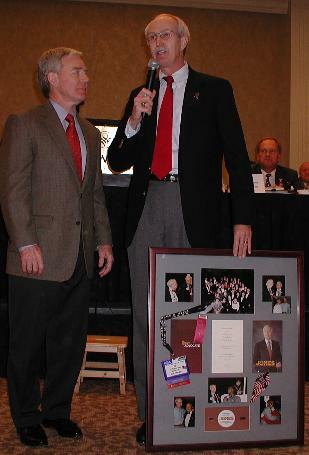 Below- 2003 ADA President, Howard Jones looks on as Ty Ivey acknowledges the special presentation award from the GDA given to him in thanks for successfully managing Howard's campaign run for ADA President. Below - 2003 President of the ADA, T. Howard Jones, at the ADA House of Delegates, "It has truly been a privilege to serve as ADA President during such a positive time. And it is just as exciting to return to my patients and the opportunity to practice dentistry." Former Georgia Dental Association President, Jim Hall has been nominated as the Secretary-Treasurer of the Georgia Dental Association. He is also serving as a member of the ADA Business Enterprise Board. Pat Patterson is serving a 2nd term on the board of the American Academy of Periodontics Foundation. 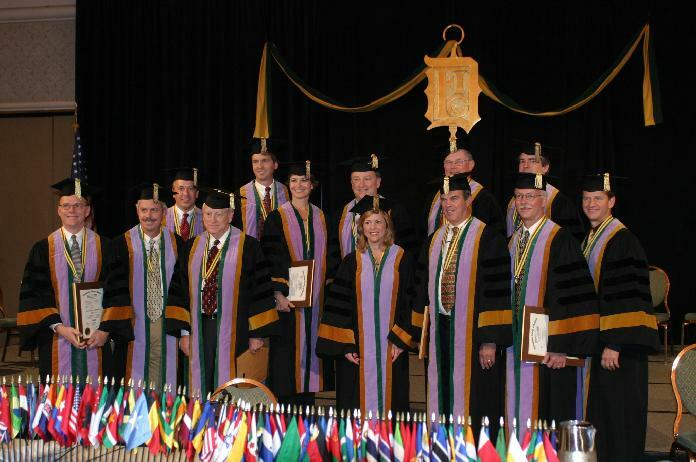 Steve Holcomb was elected as the 2003-2004 Chairman of The Joint Commission on National Dental Examinations. The JCNDE oversees the administration, research, development and security of all national dental and dental hygiene written board examinations. He serves on several national committees for the American Association of Dental Examiners including the Innovative Testing and Education Methodologies Committee and Co-Chair of the Cut Scores Sub-Committee. Steve is serving as a Scoring Area Coordinator for the Southern Regional Testing Agency, and as a consultant examiner for the North East Regional Board.